Kevin Hillstrom: MineThatData: But How Do I Avoid Paying Tolls? But How Do I Avoid Paying Tolls? "A paid search expert, an SEO expert, and a paid search vendor rep are all sitting in a car. Who is driving the car? Nobody, it's a Google self-driving car." In other words, Google is in charge. At this point, the marketing community looks at me, with an earnest expression, and says, "who cares?" Your CFO loves toll-free orders. 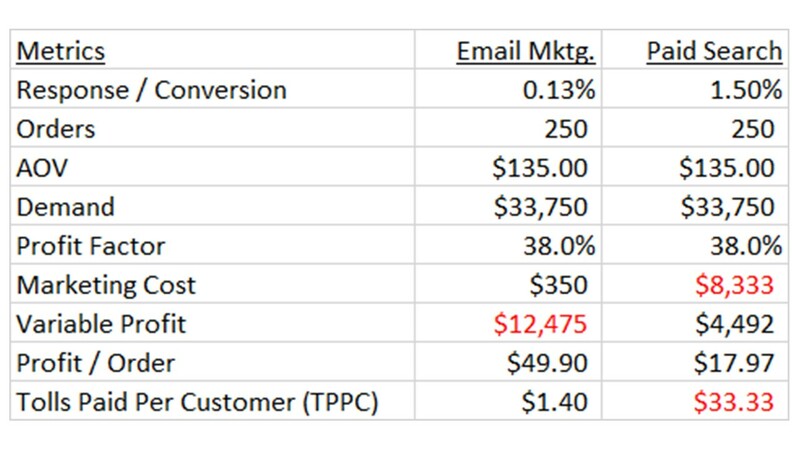 You already have a marketing channel where you generate orders that come with a toll that is close to zero. Variable Profit (what some of you call "contribution") is 3x greater. Profit per order, by definition, is 3x greater. Tolls paid per customer (TPPC) is 23x lower. Think about this ... here, we have a $135 AOV and 38% of demand flows-through to profit, meaning $51.30 of profit/contribution is created. Now ... are you ready for great sadness? I am! Of the $51.30 of variable profit / contribution generated, Google took $33.33 as a toll, leaving every other employee at your company to figure out how to divide up the remaining $17.97. Every other employee at your company divides up $17.97. If your merchandising team does not do a great job with product, if your creative team does not do a great job with imagery and story, if your IT team does not do a great job of keeping your website up, if your inventory team does not properly forecast item-level demand, if your marketing team does not work with a great pay-per-click vendor, then Google does not have an opportunity to even generate the click in the first place. And you thank everybody at your company by paying Google 2/3 of the profit, while all of your co-workers split the remaining 1/3? Do you ever just stop, take a breath, and think? We have countless ways to avoid tolls. 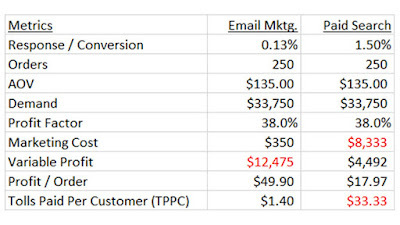 Email marketing is the tactic you are most familiar with, and unfortunately, is the tactic most ignored, a refuge for those who love to impose self-tolls via 30% off plus free shipping. All of your creative work ... all of the stories you tell ... all of your landing pages ... your home page ... the videos you create ... merchandise quality ... low prices ... your customer service, for crying out loud ... these strategies generate orders where you do not have to pay tolls (in theory). Your merchants, your creative team, your inventory team, your IT team, your HR team who fosters love of co-workers, your finance team who makes sure there is enough money for you to do a good job, countless unnamed employees including janitors and administrative assistants, and of course your marketing team all work together to make these toll-free orders happen. Start with email - it's in your wheelhouse. Then start viewing everything else you do via the context of tolls. Calculate how much variable profit / contribution the toll collectors get ... and then calculate how much variable profit / contribution your employees all share, based on what is left over. You don't have to pay tolls. Team up with your merchandising and creative teams, and do something special!